You may have been wondering if you should do something about your crawlspace because of several problems you’ve been having over the past few months or years. 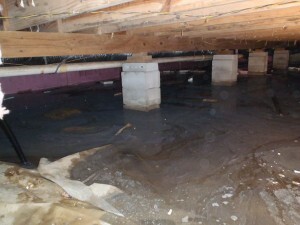 Maybe your crawlspace has been getting damp, or you’ve been seeing water sitting on the floor. Maybe you’ve been seeing the wet insulation falling down between the floor joists. Maybe you’ve seen signs of insects or rodents in the crawlspace, or even in the house above! Maybe when you come home you smell an awful odor and you just don’t know what is causing it. Worst of all, maybe someone in your home is having a terrible issue with allergies or even more serious health issues, which just don’t go away with normal cold or allergy remedies, which could be a possible indicator of mold growth and airborne mold spores. Due to the multitude of possible scenarios in crawlspaces, even though it would typically save some money in the short term to try to fix some issues yourself, rather than hire a professional for the task, we think hiring a professional, who has years of experience, would be worth their weight in gold! Our inspectors have the expertise to identify the problems, determine the solutions and put procedures into place that will correct the problems under your home, with a warranty. That is the kind of peace of mind that is priceless! Expert waterproofing and encapsulation companies, have the experience to deliver what is promised and can stand behind their work withwarranties and assure you a promise of a clean, dry crawlspace. You will notice a difference in your home immediately after the project is complete! So I would like to begin talking to you about why crawlspace decisions are really important to you, even though you may think, it’s just the space below my house, it doesn’t matter that much does it? Well, there are a few reasons you should consider re-thinking that way and I’ll name a few for you and give you a little more information below. So i’m sure you are probably concerned about the air quality in your home. The air quality in your home is determined by several factors and one of them is the quality of air in your basement or crawlspace, such as dust mites, mold and other particulates. As you know, air rises and can enter your home. This is even more pronounced, if you have heat or air being taken from that space and sent into your home, from that space. Below are reasons why that air may be contaminated. So as you know, crawlspaces have many types of flooring. They may be dirt or cement, but either type of crawlspace can still have moisture and water issues, creating unhealthy indoor environments. Both dirt and broken concrete floors can allowodors, moisture and radon gas, to escape into the air, which then is allowed to rise above into the air in the home. This can be very dangerous to the homeowner’s family’s health. If you have openings into your crawlspace that insects and rodents can enter through, they can make a home inside your crawlspace. By doing that, they are contaminating the crawlspace and thereby the air. This air is being transmitted into the home and they are also able to enter your home. Some of these pests can be dangerous to homeowner’s health and it is very important to seal up crawlspaces to not allow outside entry. If this dampness is not just a one-time event, but actually extends over a long period of time without correction, the dampness is allowing active mold growth in the crawlspace, without question. The reason we know this is, mold only needs three things to grow. One; a spore, two; moisture and three; food. Spores are available outside every day, so in a crawlspace spores enter through air spaces. Two, moisture is created by water entry and/or humidity above 60% that lasts longer than 2 days. Three, the wood structure of the home is the food. The mold will not stop eating the structure until the moisture is taken away. while there is moisture, mold is actively doing damage to the home! This is another very good reason that hiring a professionalcompany to repair and eliminate the moisture in your crawlspace would in the long run, save you money and give you peace of mind. Lastly, whenever there is a moisture problem below your home, you are risking the possibility that you are doing damage to your home. I had mentioned earlier that the moisture is damaging the structure of the home in the crawlspace, by eating the woodin the crawlspace, in the floor joist area, which is what is holding up the floors of the home and is also where the main beams of the home are. Many times we have to call in companies to replace those main beams because they have been degraded so badly by the time we have been called in. However, that is not the only thing that happens over time. Long term crawlspace neglect, can actually start to affect the living area upstairs in the home. You might find that the carpets or flooring on the first floor might need to be pulled up and replaced. The plywood on the floors, might have to be replaced, the baseboards, part of the drywall or all of the drywall on the walls might have to be replaced. If the problem has gone on for a very long time and the house has not been lived in full time, there could be even more damage such as kitchen cabinet, bathroom cabinet, and other wood item damage. So as you heard here, there are many reasons why doing something soon, would be an excellent decision. The quicker you start the project, the sooner the ongoing damage will be stopped. If you have a dirt floor crawlspace, you don’t have to pour concrete over it to solve your problem, there is a solution, we can fix that! If you have been getting water in the crawlspace for 20 years, don’t worry, we have a solution, we can fix that! If you have had a smell when you walk in the house and your crawlspace is wet and moldy, we have a solution, we can fix that! If your home has damage upstairs, we have a solution, we can fix that too! Our inspectors will come to your home. They will thoroughly inspect your crawlspace and home to find out exactly what is happening and what problems there are, if any. After the inspection we will go over the findings and go over the proposed plan of action with you. We will give you a written proposal. We would like to assure you, doing something is a long term solution, with a happy ending!